This is a coffee table book to relish and to make you think. 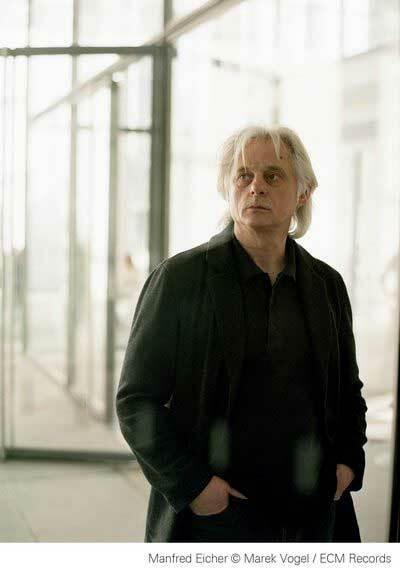 It is a history of ECM & ECM New Series, an iconic record label which realises ever onwards the unique vision of its founder and owner Manfred Eicher. He developed that in collaboration with his chosen performers in various genres, and artists who have supplied images which have played a conspicuous part in generating ECM's cult status, people about whom you will gradually learn a great deal, mainly through the experiences of the musicians themselves and the focused contributions of writers who contribute to this celebratory production, a work of art both visually and in its contents. The ECM label began with Eicher's enthusiasm for jazz, and that will need another writer. ECM New Series was launched in 1984 and has provided a platform for many musics and experiments to combine them which might otherwise have remained in obscurity. Eichert and his collaborators drew in some of the most experienced practitioners in old, new and improvised music and melded them together in recordings, some of which have became famous, questioning the HIP (Historically Informed Performance) orthodoxy represented by Early Music Review, to which I have long been (and continue to be) a devotee. Eicher has been attracted to the minimalists, whose music my impatience prevents achieving spiritual ecstasy; I coined the phrase "holy simplicity" (others might have done so around the same time) after enduring the longeurs of Gorecki's Sorrowful Songs symphony live with London Sinfonietta. Personally, I have never taken to the Pärt/Tavener aesthetic (far preferring Taverner with an "r") nor joined the million purchasers of the lucrative marriage of the Hilliard Ensemble with Jan Gabarek. But there are several essays in this book which encourage me try to reconsider my prejudices, and on the other hand, Paul Griffiths to support my own predeliction for composers who embrace complexities beyond our own full understanding over what often feel to be the banalities of some minimalists; in the New Series catalogue Eicher and ECM find room to do proud by both camps. Combing this huge tome, one is struck by the fine quality of the writing in the key articles by Helen Wallace, John Potter, Paul Griffiths and others, as by the photos of musicians and ilustrations, including those in a whole section on ECM covers. It also elucidates helpfully, and seeks to explain, the label's policy which leads to sometimes opaque liner notes and inscrutable cover images, explaining what they seek not to do in terms of explanatory commentaries and conventional publicity photos of musicians. It is a book to lose oneself in for hours and there is unlikely ever to be a book about a record company to compare with this one. But a passing nod is due to Peter Martland for his 1997 lavishly illustrated history of EMI, drawing upon 100 years of previously untapped archive material which includes over eight million documents and half a million records. Its forword by the mid-century managing director has a statement of loyalty "If I had my time again, I would wish it to be only with EMI". In a review of "Since Records Began/ EMI: The First Hundred Years", which finds its texts, supported by over 500 well-reproduced photos and reproductions, "coherent, cohesive, and well-researched" the writer, feeling obliged to put in "a negative point or two", finds the volume unsuitable for bedtime reading for risk of bodily harm. Nonetheless, "the book could have been twice as thick and we would still want more". Similarly, another review says of Horizons Touched that it is "a rich testament to the full concept of ECM which, if one can be critical, is not as indepth in places as one would want and, as a result, leaves one hungry for more." Horizons Touched is a no expenses spared production which weighs more than 2 kilos, and prohibitive postal charges led serendipitously to the pleasure of our meeting ECM's UK representative, who delivered it personally to our home near New Note's base and stayed for a long chat which brought back memories of many ECM CDs we had reviewed over the long years in various publications; some of those on line are listed below. But reading Horizons Touched has also brought to notice, tantalisingly, many that have previously escaped our notice. Musical Pointers has always reviewed re-releases (and budget labels) on equal terms with new celebrity issues, opining that the sifting before reissuing on CD is likely to tend towards quality. In ECM's case there is no deletions policy and all CDs will remain available so long as stock remains (a handful of titles have not been re-pressed). Do check out special offers on ECM discs with purchase from New Note. cddvd/GombertMagnificat.htm Gombert Missa Media Vita [ECM, Hilliard Ensemble] Good to have another CD to establish Gombert's individual voice as a leading figure..
cddvd/BachMotetsHilliard.htm Predictable, but that means predictably good. Crisp, clear performances ..